A.Y. Jackson was an avid traveler who embraced adventure. He criss~crossed this great country throughout his life, traveling by boat, snowshoe, train and automobile, painting and sketching everywhere he went. He had a special love of the northern Canadian wilderness, and his first journey to the High Arctic by icebreaker with Dr. Frederick Banting made headlines in 1927. 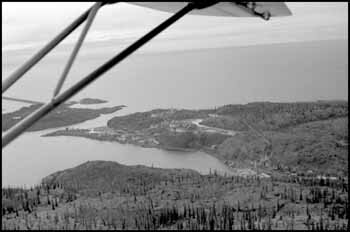 When the works produced from this trip proved remarkable, Banting and Jackson were invited by Canada’s pre~eminent geologist Dr. James Abbott Mackintosh Bell to visit and sketch at Great Slave Lake in the Northwest Territories the following year. They ventured up by sternwheeler, visiting Fort Resolution and Yellowknife. Despite the intensely challenging conditions that faced them during an extraordinarily hot summer, Jackson’s affection for the North deepened, and he yearned to explore the remote region beyond Yellowknife ~ the Barren Lands. LaBine’s operation was a rough and hardworking one, staffed with miners of diverse backgrounds. Jackson was left to himself to work as he pleased ~ which suited him perfectly ~ taking only the mine manager’s dog with him for company. He wandered the rolling low hills, settling down for more detailed sketches on wood panel in oil, making annotated pencil drawings and gathering material for the works that would be painted later in the studio. 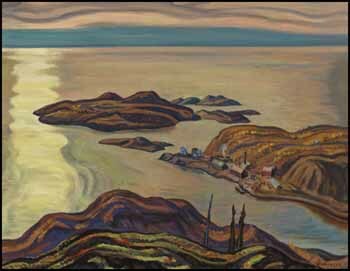 South From Great Bear Lake, in the collection of the Art Gallery of Ontario, Radium Mine, Great Bear Lake, in the collection of the National Gallery of Canada, and this magnificent canvas, Radium Mine, are just three of the masterworks that resulted from the six weeks he spent in the camp. In Radium Mine, Jackson’s characteristic earthy palette captures the rugged natural beauty of the Canadian Arctic in the fall. Leaves are tinted red by the arrival of autumn, hastened in their turning by the end of the short northern summer. Jackson’s treatment of the land employs a rich array of colours laid out in rolling lines and rippling patterns. The warm, earthy reds, velvety purples and pinks contrast with the brighter sage green areas of willow and sedge. The luminous area of reflection that Jackson has painted on the surface of Great Bear Lake echoes the lighter greens and creates a feeling of expansiveness from our vantage point on the hill above the harbour. A few sparse buildings depict the industry happening below. Not only is Radium Mine one of Jackson’s finest works, it is also historically significant. At its heart is the story of two exceptional Canadians ~ a gifted artist and a bold entrepreneur ~ linked by their thirst for adventure, imagination and love of their nation. Radium Mine reflects Canada’s vastness, abundant natural resources, stunning scenery and the creativity, innovation and strength of its people. Radium Mine has been in Gilbert LaBine’s family since he acquired it from Jackson many years ago. This powerful painting came to Heffel through Mr. LaBine’s granddaughter.